With the sharpest and most sensitive images ever taken in the near infrared, TMT and IRIS will open our eyes to the Universe in exciting new ways, exploring everything from dwarf planets at the orbit of Pluto to the most distant galaxies ever explored near the dawn of cosmic time. The sharp images allowed by the thirty meter primary aperture of TMT with adaptive optics will allow IRIS to excel at discovering bright planets that are very close to their parent stars, at distances as small as 5 Astronomical Units (5 times the size of the orbit of the earth) in interesting regions of the Milky Way. IRIS will image forming planets which are often too dim and red to be detected by smaller telescopes. The spectrograph will also excel at detailed studies of the composition of planets. For example, observing the newly discovered companions of HR8799 with IRIS will reveal, for the first time, how strong their gravity is and the compositions of their atmospheres. The mysterious and intriguing black holes predicted by Einstein’s theory of General Relativity provide remarkable laboratories for the study of physics in extreme environments. At the center of our own Milky Way galaxy, there is a black hole that weighs about four million times as much as our Sun. 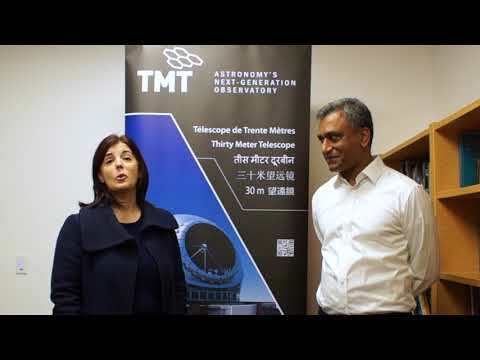 TMT will identify and map the orbits of fainter stars close to it, extending our knowledge of physics with a fundamental test of Einstein’s theory of General Relativity. Because stars in the vicinity of the central black hole will be affected by the presence or absence of dark matter, the orbits of these stars will significantly constrain our current model of dark matter, which is central to our understanding of galaxy formation. In recent years, our understanding of how galaxies form and evolve has also been greatly enhanced by the discovery that black holes reside in the centers of most, if not all, big galaxies. TMT will extend our ability to measure accurate masses of black holes in more distant galaxies and in low-mass galaxies, revealing when and how black holes are “fed.” It may even help to pin down the origins of the first “seed” black holes in the early universe. By revealing details about resolved stellar populations in nearby galaxies, the stunning image quality of TMT and IRIS will directly probe the formation of nearby stellar systems like our own Milky Way. Because it will be possible to measure the mass distributions of stars in a variety of new environments, and in galaxies outside of the Milky Way, IRIS will help us to learn whether stars form differently under different conditions. In the distant universe, IRIS’s ability to image and study the internal workings of early galaxies will represent a major breakthrough in the study of galaxy formation during the known peak period of star formation and AGN accretion in the history of the universe. The current generation of 8-10 meter telescopes has recently provided intriguing evidence for prevalent dynamically “hot” galaxies dominated by random motions that may not fit well into our current understanding of how galaxies form. Very early in the history of the universe, in the era perhaps 200-900 million years after the Big Bang, the cosmic dark came to an end when the first tiny seeds of galaxies began to collapse and to form stars. With the most sensitive spectroscopy available anywhere in the near-infrared, IRIS will yield the first real understanding the physical nature of these early galaxies, which is a forefront problem in cosmology and astrophysics. Before this time, most of the normal matter in the universe consisted of atoms of neutral hydrogen. After the seed galaxies formed, much of the hydrogen between the galaxies was ionized—the electrons were removed from the atoms; this ionization proceeded outward in “bubbles” that eventually grew together to fill space. The sensitivity of TMT and IRIS will allow us to map many of these bubbles, revealing much about the nature of reionization. Its spectroscopic capabilities may even help us to discover some of the first star clusters ever to form.